The U.S. Postal Service has been a favorite whipping boy in recent years of many Republicans in Congress. 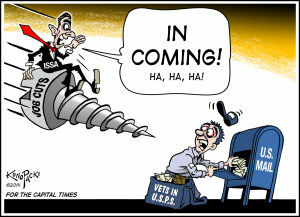 Congressman Darrell Issa, the scorched-earth California Republican who chairs the House Oversight and Government Reform Committee, is quite open about his determination to end the USPS as Americans have come to know it. He and many of his GOP colleagues believe the service is too expensive, that its practice of delivering mail to every American address — residential or commercial — six days a week needs to be cut back so that it can relieve itself of a good share of its employees, who account for about 80 percent of expenses.